Perfect timing for my latest project, the Chicken Tractor. A Chicken Tractor is a movable chicken coop without a floor. It allows the free ranging of chickens where ever the tractor is moved too. They have access to the ground where there’s grass and bugs and dirt, three things chickens love! They also get the benefits of fresh air, sunlight and exercise. The tractor can be moved over a garden or flower bed area prior to planting to help fertilize the soil and clear it of weeds, hence the term tractor. 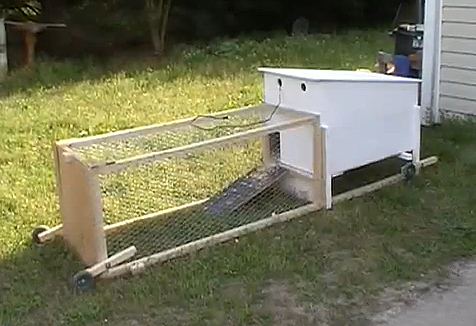 This tractor was built to house six little “bitty” chickens for now. Later, I’ll build two more with two birds in each one. They’ll eventually have a chicken coop where all six can roost and lay eggs, which should start happening around August. The total materials cost of this project was about $45. The video below is another time lapse build. It’s a long one, but it’ll show you ALL of the steps involved to make your own. You’ll enjoy the antics of my dogs and cats as they hang out in the shop with me during the build. Thanks for watching and keep on hackin! Very nice build! I will be interested to see those chicks grow! Please update us… maybe you can plan a hackaweek episode around eggs once again. When I was watching you build this I was thinking, “ouch, my aching back”. Those crates are very versatile, but would you like a higher work surface? I think it could be nice to have a table made from 2×4’s and plywood with wheels on one side that only touch when you lift up on a fold-away-handle on the other side. However, it will take up space, so what if it collapsed like a ping pong table?? I would actually like something like that for my garage and basement. Nobody likes to give up space permanently when projects can be so dynamic. Here’s kind of a simple and interesting folding worktable, not really portable though after you load it up with parts and tools. It would be better just as a work table that gets puts away after each job. I guess anything that folds up and stores flat would be good. Not to be a stick in the mud…but is this a hack? Tell me that the wheels were off a NCR microfiche reader from 1986…. or maybe a 73 buick? Else, I liked it. I think of hacking as the creation of a thing. Taking an idea, and bringing it into reality. So yeah, it’s a hack. Next week it’ll be back to electronics so come back and check it out. You could put a small solar panel on the roof of the box and have it running an old computer exhaust fan to keep good airflow through the box in the hot weather – the brighter the sunshine the more airflow! That would be cool, literally. You have got good hands, nice job!! Greetings from Spain. Please please tell me how to make those flip up wheels!! I have been trying to find plans to build ones for months for my large tractor!